I'm fairly certain I've mentioned before, that Eka and I have struggled with a fair bit of wanderlust in the past few years. We also have a healthy liking for the great outdoors, since life in Kuala Lumpur means we are mostly in the urban jungle. That's not to say there aren't green lungs within the city limits, because there certainly are. But sometimes, you do need to just get away from it all, sometimes a little bit farther away. Some of our best memories have been from a week of hiking through Japan's Nakasendo trail, the Edo-era road that connected Tokyo to Kyoto. We also remember fondly our days traipsing through the Turkish countryside of Cappadocia, where a number of valleys make the area a hiker's paradise. At some point however, we realized that two-wheeled travel was less time consuming. Much less. And by covering more ground in the same amount of time, it meant killing three birds with one stone, namely allowing us to be in the great outdoors, saving travel time, and therefore letting us see more sights than if we were on foot. Cycling was a win-win solution to our need to maximise leave days, a common problem for the normal working adult. It all began in Chiang Mai, Thailand, also widely known as the Rose of the North. We had a week to explore the city, and we were not keen to spend a small fortune on bicycle taxis or "beca" as they are known here in Malaysia. For the trip, Eka and I left our bicycles behind, since we had not done enough research on the best methods to pack them for air travel. We also knew that rentals would be easily available there. This is the resulting article on our brief week in Chiang Mai, first published in the Cycling Plus Malaysia July-August 2016 issue. As a cycling destination, Chiang Mai is fast becoming a regional powerhouse. The relatively small city in Northern Thailand is situated in a valley, flanked by mountains on either side, and is home to some 170 thousand people, with a larger one million residing in the greater metropolitan area. The valley itself is fairly flat, with a spiderweb of roads linking different villages, making cycling over the general 200 square kilometre area fairly easy. It was my first time in what is called the Rose of the North, and I must admit that I arrived not knowing what to expect, having not done any research at all before boarding the flight to Thailand. “Surprise me!” I mentally challenged Chiang Mai, and it did not disappoint. I quickly learned that the city has been a Mecca of sorts for all manner of cyclists, with many using it as a base to traverse the Northern Thai region. The former capital of the ancient and culturally rich Lanna Kingdom has a similar vibe to Siem Reap, Cambodia, but with a more developed range of creature comforts that general city folk are used to. This is thanks to a thriving expat population and the droves of tourists both local and "farang", that drive the local economy. In terms of urban planning, the city has a fairly simple road system with many back lanes cutting through the residential areas, easily navigated by explorers on two wheels in the digital age of Google, Apple Maps, Waze and Strava. Geographically, Chiang Mai’s historical centre is located within a square parcel of land in what used to be the walled city, circled by a moat for defence. Only sections of the ruins of the walls remain, as well as the gates of the city. Within the walled city, there are more than 30 temples dating back to the founding of the Lanna Kingdom, all easily accessible by bicycle. If you count the outskirts, there are more than 300 temples open to the public, barring any restrictions on women. Cycling within the city limits was not too laborious an affair, with the first of our cycling tours with our guide Aom, who expertly led us on an easy scenic and cultural loop of more than 30km. The pace of life is slower here in Chiang Mai, and so is the traffic, but do keep in mind that like most travel destinations, the peak period will see a general swell in the traffic and other tourist related activities. Within the last few years, cycling lanes have been painted on to the roads, and while most cars will be willing to stop or give way to cyclists, general safety rules will still apply. The city has since developed a burgeoning cycling movement, and signs for motorists to “share the road” are placed at regular intervals. In fact, on the day of my arrival, I spotted cyclists on folding bikes picking their way gingerly around the crowds of the night market, complete with the prerequisite blinking lights for evening rides. I’m told that this is a normal affair, with weekend rides and events organised regularly by the locals. Foldies are evidently just as popular as road bikes and mountain bikes here, and many shops stock a number of different brands. The urban cyclist will find it easy to rent a bicycle, which is fairly cheap, but the rates vary depending on the quality of your chosen ride. 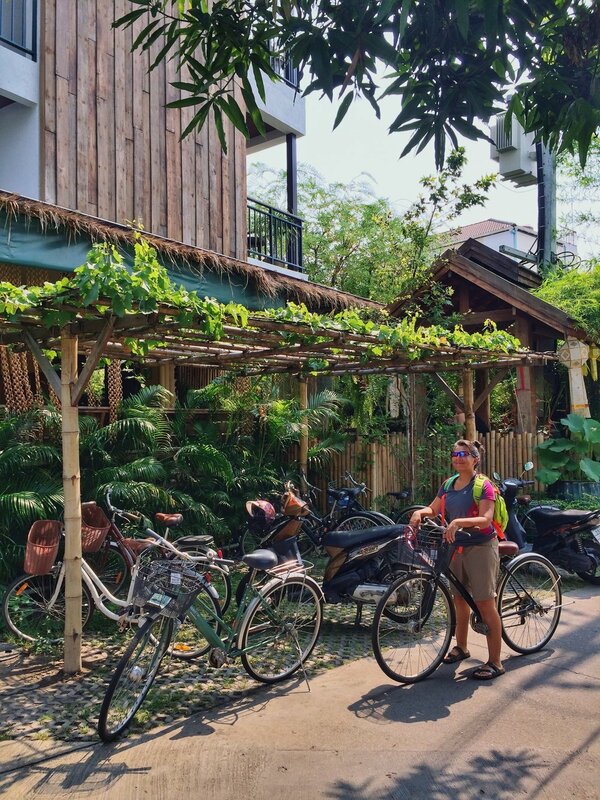 They are available on almost every single street in Chiang Mai, and many cycling tours are available for a quick introduction to the area. An easy to remove pair of multi purpose shoes will be a good investment, considering the many temples require you to walk in barefoot. A number of public toilets within the larger temple compounds also impose the same rule, an odd curiosity that I have only observed in the city and its surrounding areas. As a Southeast Asian myself, I’d made the incorrect assumption that the climate would not be too far off from Malaysia. What I’d neglected to take into account, was that unlike Thailand’s other regions, Chiang Mai has three seasons, the cool or dry season, the hot season, and the wet season. February to June is the off peak period for a good reason, and my visit was right smack in the hot season, when temperatures can go beyond 40 degrees celsius. This is a stark contrast to January this year (2016), when the thermostat plunged to around 12 degrees. Any cyclist will admit that there is nowhere you feel the effects of the El Niño phenomenon more acutely than the open road, when the sun is at its zenith and the air is still. Maneuvering the winding road through dusty longan plantations and paddy fields on a rented mountain bike, I spotted at least half a dozen unfortunate amphibians flattened by passing cars and baked to a crisp by the blistering heat. The Asean region has suffered greatly from the recent heatwave, with Chiang Mai no exception. Vast fields of paddy crop have dried up, forcing many farmers to turn to the less moisture intensive alternative of soybean to keep their coffers full. The heatwave has been so severe, that the few months of rain the paddy fields depend on to grow here, has been cut down to a single month. Alternatively, time your visit to coincide with cooler temperatures. However, you would have to deal with the hordes of other visitors who would have made the same decision to travel during the peak season. The heat or the crowds: take your pick. Next up was a slightly more challenging 65km ride back from Lamphun, a half an hour train trip away. On the road outside the city, conditions are sublime due to a lack of traffic. Our second guide Bym recounts her previous tours into the countryside with pro cyclists, former Tour de France competitors, and even those who represent their countries. In fact, the Malaysian and Laos national teams have been known to train in Chiang Mai for competitions, as do the Terengganu Cycling Team, and other well-known outfits from around Asia. Further out, the mountains of the Thai highlands include the Daen Lao Range, Thanon Thong Chai Range, and the Khun Tan Range; which give ample choices for mountain bikers seeking the technical trails that snake around the countryside. In the nearby Doi Suthep National Park some 15 kilometres northwest of the city, the highest peak reaches just over 1,600 metres in altitude. For the ultimate challenge, Doi Inanthon is about 50 kilometres southwest of Chiang Mai. It is the highest mountain and road in the country, registering more than 2,500 metres above sea level. To top it all off, multi-day rides are fairly fuss-free, with many stops for restocking water and food, and a number of competent bike shops even outside Chiang Mai itself. Massages are also cheap and easily available, making the city and Northern Thailand in general, the perfect cycling haven in Asia. For a more off-road adventure, our friends at Doowaroda have also documented their own trip to the historical city. Read more about it here. Our Chiang Mai Highlights bike tour with Aom was with Spiceroads, which offers a wide range of tours in and outside the city, at different difficulty levels. Our Chiang Mai countryside by bike ride with Bym was with Grasshopper Adventures, which also has a number of tours to suit different riders. For accommodation, the city has many places to choose from, but we highly recommend Green Tiger House, where you can get free water refills, coffee and tea, as well as unlimited toast 24/7.